It is also helpful to have a list of these soccer drills to rotate through. It adds an element of surprise and keeps players on their toes as they have to learn new games. Once you find 3 - 5 warm up activities you know they love then you can rotate through them. This way it will take less practice time to explain and players can experience success as they get better at these games. This game is placed in a relatively tight space (8 yards X 8 yards) and it may be necessary to use two fields depending on the number of players. This activity is fun and engaging and works on athletic movements and awareness. To set up the field use discs to mark an 8 x 8 area. Each player will place their ball along the outer boundary. The players will all be inside the field of play without their ball. On the whistle the players run around trying to tag each other. When they get tagged they hold the body part that was tagged and yell “ouch”. If they get tagged again by someone else they must hold that body part as well and yell “ouch” again. Now they are holding two body parts. When they get tagged a 3rd time they run to their ball on the outside of the field and dribble the ball with four controlled touches. Once they do that they can return to the field with no injury. Have each player dribbles their own ball inside the field of play while trying to tag the other players. If they get tagged three times they must do six toe taps before coming back into the game “healthy”. Guaranteed your little soccer players will love this game! Once again this game is played on a small field about 10 yards x 10 yards. Divide the players into two teams. The players on one team will start the first round with a ball, the players on the other team will start without a ball. On the whistle the players with the balls will try to hit the other players with their ball. If they hit a player on the other team they get a point. If not, they must retrieve their ball and try again. Each round will last one minute and after each round the teams switch so that the team without the balls will now have a soccer ball. This activity is actually a great dribbling drill too. It teaches players awareness while working on ball control. Set up an area about 15 yards x 15 yards marked by discs or cones. Each player will have a soccer ball. On the whistle the players will control their own ball in the designated area. The coaches will roam the field and try to tag players. When a player is tagged by the coach they must spread their legs wide and hold their ball up over their head. The only way to get back in the game is by one of their teammates dribbling their own ball through their legs. This drill focuses on keeping your head up and having awareness to the surroundings. They have to know where the coaches are at all times and at the same time try to navigate the field of play to help save their teammates. Here is another game the young players will absolutely LOVE! Once again set up a square field of play that is a little larger like 15 - 20 yards. Every player will have a ball inside the field of play. On the whistle each player will work on their passing technique but they are trying to hit the other players balls. When they hit another player’s ball they get a point. If their ball gets hit they lose a point. While this is not a specific passing drill it does emphasize passing and ball control fundamentals at the same time. Be prepared for lots of yelling and screaming! Once again you will need to mark off a field measuring about 15 - 20 yards. You will use half the number of soccer balls that you have players. So if you have 8 players then you will place 4 soccer balls in random areas within the field of play. The players will choose a place to start along the outside of the field of play. On the whistle the players will race for the soccer balls. If they get possession then they will try to keep possession and protect it from being stolen. If a player does not have a ball they will try to steal one from another player. This small sided game is a good way to get the competitive juices flowing in your players. You can also play in teams by placing an odd number of soccer balls in the field of play. At the end of the round the team that possesses the most balls wins that round. In this version players need to communicate and work together. Every team is different so you need to be perceptive to how these drills are helping or hurting your objectives. Get creative and modify these drills to suit your team better. If you find some good variations and combinations then please leave a comment below and let everyone know! 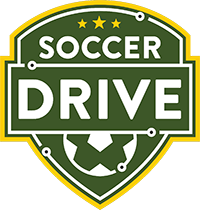 SoccerDrive is committed to providing great content and resources to youth soccer coaches. We provide content in the form of animated soccer drills, animated tactics, and blog posts.